This article was posted on 22nd July 2015. One of our biggest pleasures in life comes from a fresh bed - nothing can beat climbing into bed at the end of the day with crisp linen, fluffy pillows and beautifully smelling duvet to send you into sweet slumber. We are forever being told about the amount of time we spend in our beds (on average a third of your life) so it’s wise to make that time as comfortable and pleasant as possible. 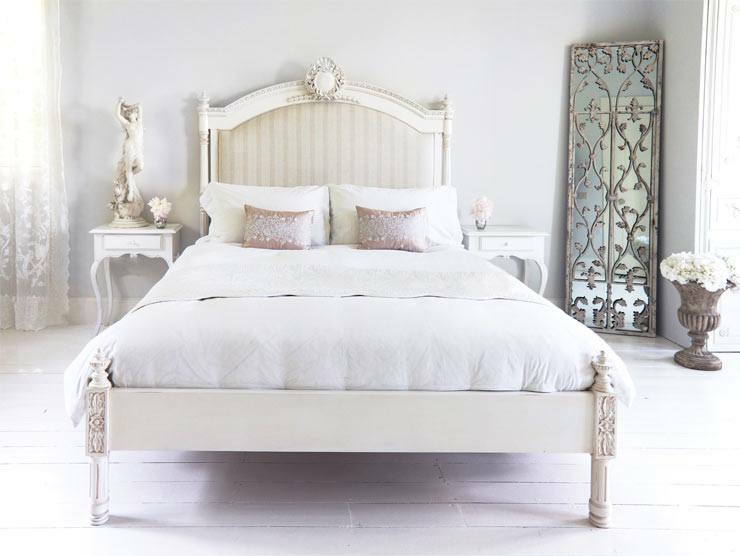 It’s not possible (unless you’re royalty perhaps) to have your sheets changed every day, but we’ve put together some tips on how to keep your bed fresh for as long as possible. £235; Kensington Screen, £345; Tiana Boudoir Cushion, £30. Let’s start with a good base! Mattresses should be turned regularly (unless the manufacturer states otherwise), not just turned over but turned north to south/east to west. Turning your mattress regularly ensures even wear, weight distribution and maintains its shape. Adding a mattress topper or mattress protector will also help increase the comfort of your mattress, as well as protecting it from day-to-day spills. ~ Hoover your mattress on a low suction level once a month – paying special attention to the buttoned areas and along piping. You’ll be amazed by the amount of debris that can collect in these little crevices! ~ For spills and stains, tip your mattress on its side and sponge with cold water – don’t over-wet the area! Blot dry and spot treat with carpet or upholstery cleaner. Rinse thoroughly and blot again. ~ For any nasty stains or odours, sprinkle some bicarbonate of soda on the area – leave for a few hours then hoover off! Never dry-clean feather duvets. If you are unable to load your washing machine with the duvet head to your nearest launderette for one of their large machines, checking first that there are no holes or weak points in the casing fabric. Wash on a gentle cycle, using one-third of the usual amount of detergent (otherwise you could end up with a really bubbly situation). Shake out while damp to stop the item going lumpy, then dry thoroughly (on a low tumble dryer setting) and leave out to air for a day. ~ When drying your duvet pop a couple of tennis balls in the machine to thump away at the duvet as it dries – this will give you a fabulously fluffy duvet! Pillows take a real battering. Our heads rest on them for around eight hours a night, depositing – here’s the cringey bit, dead skin, sweat, dribble and other nasty stuff! They should be washed at least twice a year to remove not only all that debris, but also the dust mites that enjoy feeding on it. 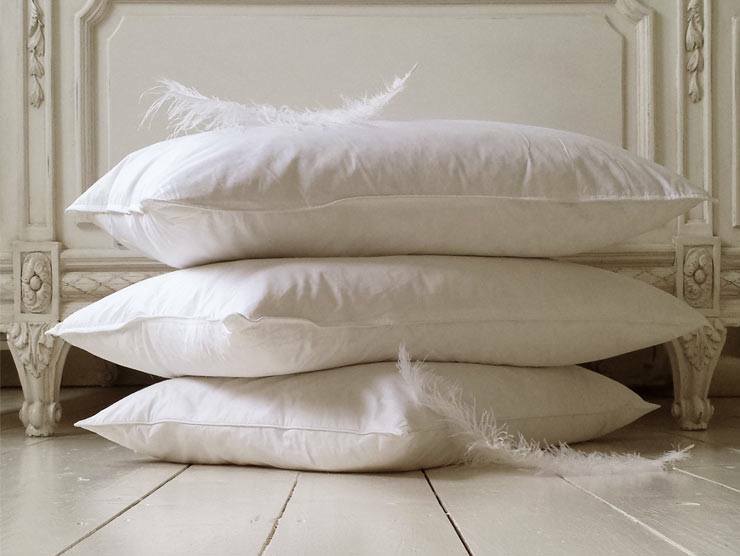 Many pillows, even feather ones, can be machine-washed. Check the label, then follow the instructions given for duvets. Don't dry-clean because the chemicals are difficult to remove and you certainly don't want to be breathing in toxic fumes during your dreams. ~ Turn mattresses regularly and vacuum thoroughly. ~ Wash bed linen at least once each week, at 60°C or higher. Cooler washing temperatures will remove allergens, but won't kill the mites. If your bed linen can't take such high temperatures, placing it in the freezer overnight before washing will do the trick. ~ Keep humidity and heat below levels that help mites thrive. Leave a window open at night and air the bedding and the room in the morning before you make your bed. ~ Showering or having a long soak before bed will certainly help your bedding stay fragrant. ~ Air drying your sheets will ensure the fabric holds the fragrance from any detergents or conditioners you use. ~ As before, air your bed in the morning. Throw back all the sheets, open the window and let the air circulate. Even better and a great excuse not to make the bed – leave it to air all day! ~ Use a lavender and water spray to refresh your bedding and aid a good night’s sleep. Simply combine (60 ml distilled water and 10-15 drops of your favourite essential oil in an empty spray bottle et voila! ~ When washing your sheets, pop your pillows and duvet on the washing line (easy to say in this lovely weather!) to freshen and fluff. Most wool blankets should be dry-cleaned. Synthetics and cottons are usually machine-washable. Launder at least once a year and dry naturally away from direct heat. Rest blankets occasionally to prolong their life. 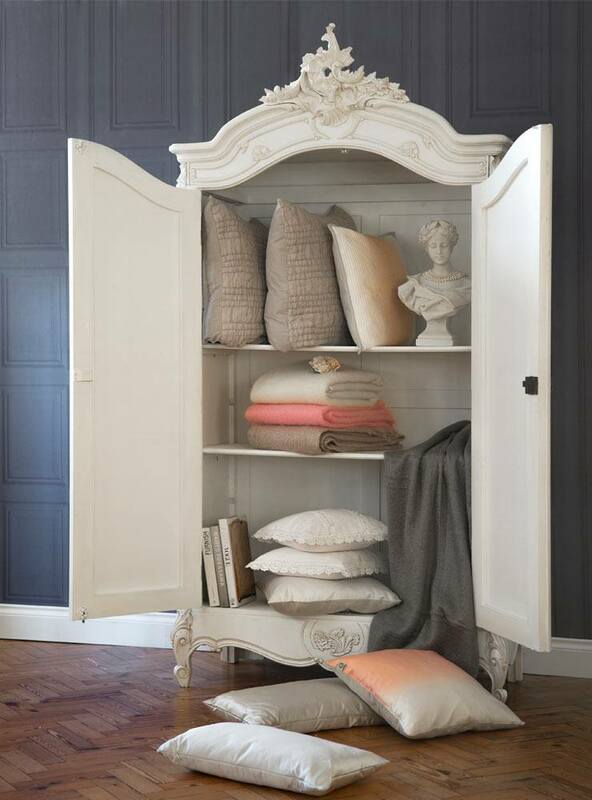 When not in use, wash and dry thoroughly and store in a breathable bag in a cool cupboard. Grey Ombre Silk Cushion, £52; Pink Ombre Silk Cushion, £52.